Traditional Chinese medicine (TCM) is an ancient practice that developed in China over thousands of years. Rooted in Taoist philosophy and based on detailed observation of the natural world, TCM understands humans to be microcosms (or miniature versions) of universal energies. The ancient scholars took stock of their environment and noticed that the elements around us are also reflected in us. They concluded that these five elements (wood, fire, earth, metal and water) are integral aspects of our bodies, minds, hearts and spirits. The balance of these elements within us – and the harmony between the two complementary yet opposing universal forces of yin and yang — supports health. Disease results from imbalances within these forces. To create and maintain healthy balance, TCM offers many techniques, including qigong (energy movement practice sometimes referred to as Chinese yoga), tui na (Chinese therapeutic massage), cupping (use of glass, plastic or silicone cups on the skin), gua sha (“scraping” of the skin), moxibusion (burning of cone-shaped preparations of herbs, most often mugwort), Chinese herbal medicine and so on. Acupuncture is one of the most popular and well-researched of the many modalities TCM has to offer. In the West, TCM is typically not used as primary care medical modality and should not replace conventional care or be used as a reason to postpone seeing a health care provider about a serious medical problem. However, TCM can often provide relief in cases where biomedical diagnoses and treatments are lacking. Research also shows that TCM is an effective adjunct for conventional treatments such as surgery, radiation and chemotherapy, minimizing negative side effects and strengthening the body’s innate healing ability. Acupuncture involves the insertion of sterile, metal, very thin, filiform (meaning “thread or filament-like”) needles at specific locations on the body called acupuncture points (or acupoints). According to TCM, these acupoints are located on energy pathways called meridians and their stimul ation affects the health and harmony of the body and mind in a powerful way. Acupuncture may also involve electrical stimulation of points and is often combined with moxibustion and other TCM modalities such as cupping and qigong. See WHO’s overview of the evidence base for acupuncture for more information. Are there conditions that acupuncture cannot treat? Traumatic emergency situations or acute conditions in which the pain comes on suddenly and is very intense should not be treated, at least initially, by acupuncture. Of course, if you are in a motor vehicle accident or have just broken your ankle, you would be unlikely to make an appointment for acupuncture. But some conditions unsuited to acupuncture are less obvious, such as the pain concurrent with acute appendicitis, a heart attack or keratitis (infection of the cornea of the eye). Your acupuncturist is trained to distinguish between conditions that require immediate attention of biomedical health professionals and those that are (often more effectively) treatable with acupuncture. Often these are chronic conditions for which the conventional biomedical treatment options are limited. Acupuncture can also be a strong adjunct to rehabilitation from acute events like strokes and heart attacks and is very effective at treating non-emergency acute conditions such as common colds. Acupuncture has also been shown to be effective for alleviating adverse reactions to conventional medical treatments such as radiation or chemotherapy, and for postoperative pain. There are many theories as to why and how acupuncture works. It’s important to distinguish between how acupuncture is thought to work from a modern biomedical (rationalist/reductionist) perspective, and how Chinese medicine understands its own mechanisms of action. Space doesn’t allow exploration of these topics in full; however, an underlying similarity between these two very different perspectives is that acupuncture works by stimulating the body’s own healing mechanisms. According to biomedicine, this happens by manipulating various aspects of the endocrine and nervous systems (such as endorphins). According to TCM, healing happens through the re-alignment of the free flow of qi (or vital energy) and other vital substances in the body. How safe is acupuncture? Can acupuncture injure me? Acupuncture is considered safe when performed by a trained, qualified professional using sterile needles. Needles used in acupuncture are always sterile and single-use, to eliminate the possibility of disease transmission via their insertion. Qualified practitioners are fully trained in anatomy and physiology and aware of acupoints not appropriate in particular cases, such as pregnancy. Adverse effects are generally mild and can include bleeding after needle removal and post-treatment bruising of the acupuncture site. Typically, these are short-term and manageable and do not compromise the benefits of the treatment. Injuries that do occur generally result from poorly trained, unqualified practitioners. These more serious adverse effects such as pneumothorax and infections are rare and, historically, have been the result of unskilled, unqualified practitioners and failure to use the sterile, single-use needles now required by law. If in doubt, speak to your acupuncturist about his or her qualifications and any questions you have about safety. What does acu puncture feel like? Does it hurt? The needles used are very thin and typically do not hurt when inserted, although you may feel slight tingling, distension or “humming” sensation during treatment (considered a good sign). Are acupuncture needles similar to the needles used at my doctor’s office? 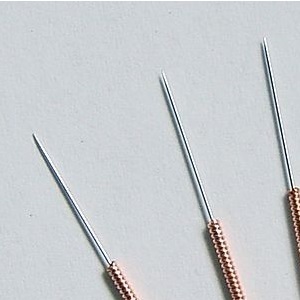 Acupuncture needles are very different from the hypodermic needles used in medical offices to deliver vaccines and draw blood. They are much, much thinner, and are solid rather than hollow, making them virtually painless on insertion and capable of eliciting a very marked relaxation response rather than the familiar “Ouch!” response most of us have had to hypodermic needles. You may even fall asleep! I’m still a little bit afraid of needles. Can you do a treatment without using them? Gua sha, which involves use of a special tool to open up meridians, boost blood circulation and detoxify your body. Since April 2013, acupuncture and Chinese medicine has been a regulated health profession meaning that all acupuncturists must belong to the College of Traditional Chinese Medicine Practitioners and Acupuncturists of Ontario (CTMPAO). To register with the College, all acupuncturists must complete three to four years of extensive and comprehensive graduate training at a qualifying school, pass two national exams, and meet strict guidelines to practice in Ontario. Other regulated health care professionals, such as naturopaths, massage therapists, physiotherapists and chiropractors, are sometimes mandated to provide acupuncture by their respective regulatory colleges. These professionals can provide needling services but are not qualified to undertake the full diagnostic assessment that is foundational to traditional Chinese medicine and acupuncture. Some of these professionals may even be granted membership in CTCMPAO as a result of extra training they have done in acupuncture. Sometimes this training is similar in completeness to that of an acupuncturist; sometimes it is not. In many cases, these professionals, although qualified in their respective disciplines, have not completed a full training program in acupuncture and have not passed the national acupuncture exams. It’s best to speak directly to your acupuncturist to determine her or his qualifications. How do I find a qualified, well-trained acupuncturist? The first step is to ensure that the acupuncturist you are interested in visiting is registered with the College of Traditional Chinese Medicine Practitioners and Acupuncturists of Ontario (CTCMPAO) via their registry of practitioners. Next, interview the practitioner to determine his or her qualifications and training. Ask about the number of hours of TCM and acupuncture training she has completed and whether she has written and passed the national acupuncture exams. You can also ask whether the practitioner has experience working with health issues such as yours, and what other services are available as adjuncts to your treatment. Most fully trained acupuncturists provide nutritional guidance, herbal advice (although not Chinese herbal prescriptions unless also qualified as an herbalist) and other TCM modalities such as moxibustion, cupping, gua sha, qigong and tuina massage. As part of my service offerings, I also provide yoga sequence prescriptions suited to your particular needs. If you are a student or senior, or if you have financial constraints, ask about sliding scale fees or community (group) acupuncture services. Ultimately, your choice of practitioner will be founded on how well you connect — whether you feel listened to, supported, respected and nourished by the relationship and your treatments. Sometimes this can simply be a matter of the “chemistry” and mental and emotional resonance between the two of you, rather than a specific skill set.